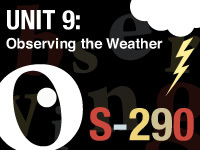 This webcast covers procedures for taking accurate weather observations using belt weather kits and descriptions of other common weather observing equipment used in fire weather. In addition, maintenance of the primary components of the belt weather kit are demonstrated. The unit is very visual, i like. The gentleman giving the instruction was a master of the subject. helped learned about how a belt weather kit works. the information was pertinent and insightful. The animation videos are particularly helpful in the learning process. Questions with multiple questions within make for a Hard question to get correct. Muy útil para comprender como se relacionan los factores climáticos con el incendio y como obtener lecturas correctas. Change wording on some of the questions. The video instruction videos were EXTREMELY helpful and very clear! Definitely need to know information. The information was presented in clear language which was easy to understand. Something overlooked, taken for granted when conducting tail-gate training. Cirus cloud cover are not mentioned mentioned in the cloud module but it is mentioned a few times here. Good overview of the components in the belt weather kit. I like the guy they picked for the field demos - quiet, clear, no fuss. The only way to improve this lesson would be to go out in the field with the instructor. I liked the combination of exercises and narration. There were a good number of check-in points to make sure you were following along. Me gustaría que este tema lo pusieran en castellano. Feedback on missed quiz questions. Great visual aids and videos of how to operate equipment. This was a great familiarization of that tool. I feel much more comfortable in the use and relevance of the belt weather kit. Good, short and sweet examples, much more useful to what I need than many of the other units so far. I learned how to use a belt weather kit in s-130, kinda redundant. This was a great lesson! thank you. I liked the video demonstrations. And I love taking weather at wildland fires so I really enjoyed this lesson. Question about on-site weather observations haven´t any correct answer. This is the best unit yet. I have used the belt weather kit a lot and this is dead on with great info for those that haven't. Belt weather kits are portable yes but not exactly lightweight when compared to a electronic hand-held which can produce all needed info. Yes belt weathers kits are great to compare but we have some pretty dead on and expensive equipment. That question kept getting me for those reasons. The units that are narrated are much more effective for learning. This lesson achieved its intended TLO. I am tired of the ridiculous attempts and effort that is put into confusing the student rather than learning........ FS needs to re-evaluate its teaching. Having used the belt weather kit on many fires, this course correlates very accurate information. A real practical course for line operations. Good explanations, easy to understand. Two thumbs up. Much better than unit 8. Great review of the use on the belt weather kit. Great information on the maintenance for the kit. This module is very easy to understand and fun to take. I learned a lot from this module and recommend it to anyone. Upon completion of this unit, students will be able to: 1. Describe when, how often, and where to take weather observations on wildland fires. 2. Describe the importance of having field observers or other fire personnel assigned as lookouts for potentially hazardous weather and wildland fire behavior conditions. 3. Demonstrate the correct use and maintenance of the belt weather kit in the field.